Home > NewsRelease > Why Hire Outside Directors When Private Companies Don’t Have To? 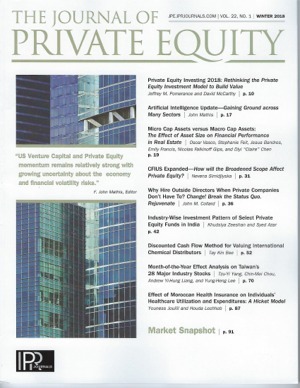 Journal of Private Equity published Article of Interest by John M. Collard, turnaround specialist, interim executive, outside independent director, capital finder, and private equity advisor. Why Hire Outside Directors When Private Companies Don't Have To? Change! Break the Status Quo. Rejuvenate. You need these guys — to increase cash flow and provide valuable guidance, contacts, growth, and credibility. Outside directors are generally hired based on their experience, effectiveness, connections, and access to capital, which can be very beneficial to a company. Companies that are committed to going through significant business change (turnaround, transition into new markets, increased cash flow and corporate growth, generational ownership transfer), are anticipating a major liquidity event, or have shareholders who are not active or business savvy need guidance. An outside director is a member of the board of directors or advisors who is not part of the executive team. Outside directors are advantageous because they are experienced experts who rarely have conflict of interest and they often see the big picture differently than insiders. Traditionally, companies invited friendly advisors to join their board. Now, there is more risk to directors as a result of legislation (Sarbanes-Oxley). Whereas there is formality (reporting, responsibility, risk), liability, and more expense (e.g. D&O insurance) to a board of directors, there is a budget-friendly alternative in the form of a "board of advisors" that is beholden only to management. The main difference is in where the fiduciary duty lies: to the shareholders or to management. Trusted outside directors can provide guidance for the business to produce value – for the business. 1. Outside directors increase cash flow/business growth. A Forbes/Lodestone Global survey shows 97% of companies reporting increased revenues and earnings, with increases of 56% since adding a board with outside directors. 2. Outside directors can be a valuable resource. They bring a new set of skills and ideas, while you maintain control. 3. Outside directors provide an external source of accountability, which is key for businesses to move forward. 4. Outside directors are on the side of owners, shareholders, and managers, these advisors answer only to you. 5. Outside directors add credibility. When it comes time for a liquidity-seeking event, they send a message that your company has leadership and guidance. With a board of directors, your company immediately gains legitimacy and a panel with expertise that you probably do not have in house. Although the role of board members is to direct accountability, develop strategy, protect assets, and oversee implementation, they are often adept at guiding major decisions, serving as a resource, and being a confidant to the CEO. Benjamin Zander, conductor of the Boston Philharmonic Orchestra, discovered that he was the only person on stage that didn't make a sound. He realized that his job was to create great things out of the individual talents of the musicians in front of him. This is very much like the role of an outside director: to bring out the very best in the company's inside talent, to guide the company to meet its goals. Management makes decisions and maintains control, based on guidance and information. Outside directors bring an independent perspective, develop strategic thinking and planning, use their experience and objectivity, provide their Rolodex of contacts, find capital, and guide transaction activity (Exhibit 1). Many of these benefits are absent in companies, so outside influence should be used to your benefit. After all, you have nothing to lose and everything to gain by considering their advice when you make decisions. Create a culture and structure that will withstand third-party accountability to add value to your business. Start thinking as a serious, growing company and prepare for a future life as a public company or for increased scrutiny of investors. The CEO needs unbiased advice and diversity of opinion from outside directors who care about the company's success, but who can view things from a distance and a different perspective. CEOs will be well served by adding board members who can challenge them and decisions they are about to make. Outside directors should constructively challenge and contribute to strategy development, implementation, and infrastructure. Outside directors can be particularly adept at guiding the company into new markets or changing direction when trouble occurs. Because these outsiders have experienced these situations and guided other companies through the pitfalls, they can certainly guide you to success with less trepidation. The very nature of growth implies that a company is going to new opportunities. It is refreshing to make that journey with the help of an advisor who has been there, and done that, before. This objectivity can help you through the obstacles. Every company needs help when it wants to grow, prosper, or turn around. Outside directors can extend the company's reach by using their own contact network, including colleagues that can get involved to provide guidance and resources. Outside directors often have a database of contacts who can supply capital, both in the form of equity (investors) and debt (lenders). Some have more extensive and higher quality databases than others. This means that you can get in front of many financing resources quickly once an expression of interest package is ready. Present your opportunity in terms the investor or lender wants to see. Your company is the product. Prepare for that liquidity event. The best time to sell a company is when a buyer wants to buy and has cash, which could come when you least expect it. Be prepared and work toward ultimate valuation throughout the process of growth. Do not be surprised when you come to the realization that the company is not attractive to investors or lenders. This means that you have the opportunity to rebuild the company, or parts of it, so that it can be considered a good deal. Build a company in which investors want to invest. Businesses that create value: Consistency. High probability of future cash flows: Promise of cash. Market-oriented management team: Generate revenue. Ability to sell and compete; develop, produce and distribute products; thrive and grow: Track record. Fair entry valuation: Realistic return potential. Exit options: Investors want ROI multiples. Outside directors are adept at negotiating deals. They elevate you (management/board) to the decision-making role. Hire that outside director. They bring about change. John is Chairman of Strategic Management Partners, Inc. (410-263-9100, www.StrategicMgtPartners.com ) in Annapolis, Maryland. John is a Certified Turnaround Professional (CTP), and a Certified International Turnaround Manager (CITM), who brings over 35 years senior operating leadership, $85M+ asset and investment recovery, 45+ transactions worth $1.2B, and $80M fund management expertise to run troubled companies, serve on and advise company boards of directors, and raise capital. John has parachuted in as the Interim CEO, CRO or senior executive to turn around troubled entities, and serves as an outside director. John is inducted into the Turnaround Management, Restructuring, and Distressed Investing Industry Hall Of Fame. John is Past Chairman of the Turnaround Management Association (TMA), Past Chairman of the Association of Interim Executives (AIE), and a Senior Fellow of the Turnaround Management Society. John is a Founder of TMA. John is Prince George's Business Leader of the Year. John is honored with the Interim Management Lifetime Achievement Award from the Association of Interim Executives. John is honored as Most Admired CEO in Maryland by Daily Record. John is honored with SmartCEO Distinguished Leadership Award. Strategic Management Partners, Inc. (www.StrategicMgtPartners.com 410-263-9100) is a turnaround management firm specializing in interim management and executive CEO leadership, asset and investment recovery, board and private equity advisory, raising money, and investing in and rebuilding underperforming distressed troubled companies. The firm has been advisor to Presidents Bush (41 & 43), Clinton, Reagan, and Yeltsin, World Bank, EBRD, Company Boards, and Equity Capital Investors on leadership, rebuilding troubled companies, investment recovery, turnaround management and equity investing. SMP is celebrating 25 years of service to its clients. SMP was named Maryland's Small Business of the Year, and received the Governor's Citation, Governor Martin J. O'Malley, The State of Maryland as a special tribute to honor work in the areas of turning around troubled companies and saving jobs in Maryland. Turnarounds & Workouts Magazine has twice named SMP among the 'Top Outstanding Turnaround Management Firms'. American Business Journals named SMP among the Most Active Turnaround Management and Consulting Firms in Baltimore, Washington, and the Mid-Atlantic Region. Global M&A Network Turnaround Atlas Awards named SMP as Boutique Turnaround Consulting Firm of the Year.